In lieu of my endless supply of Guelaguetza's mole paste ;) Paola and I decided to get creative with mole this week and modify this classic Pork en salsa verde recipe by substituting the chiles chipotles (found in the original recipe) with a bit of Guelaguetza's Mole Coloradito Paste. It was incredible! For those of you who are like me and always ask "for something spicier" at restaurants, we recommend you take our advise on adding the serrano peppers for garnish, it gives it that perfect kick at the end. oh, and don't forget to tag us on your cooking posts. We LOVE going through all the posts! Bring water to a boil in a small saucepan, enough to cover your tomatillos. Place tomatillos in the saucepan, and cover with water. Bring to a boil over high heat; cook until slightly soft, about 5 minutes. 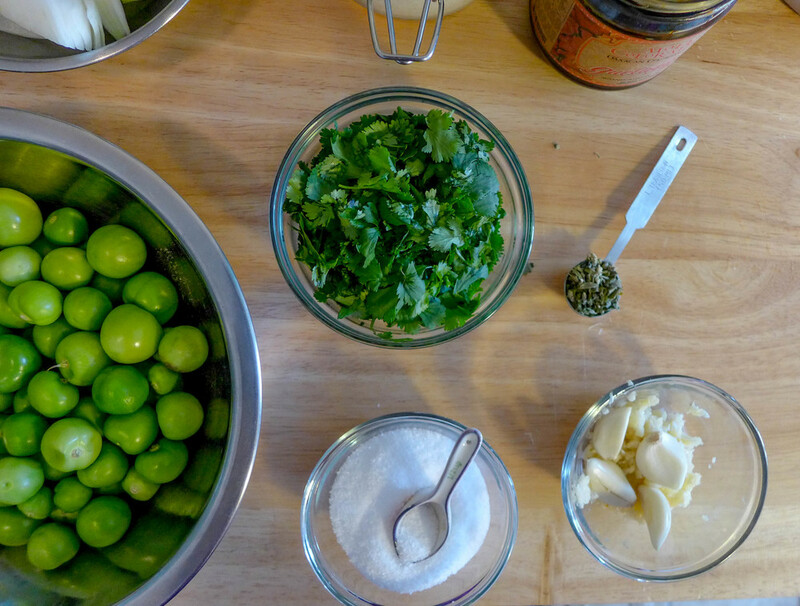 Carefully strain the tomatillos and place them in a blender or food processor along with the mole coloradito, cilantro, sugar, and 4 whole cloves of garlic. Pulse until puréed; set salsa aside. Season with salt. 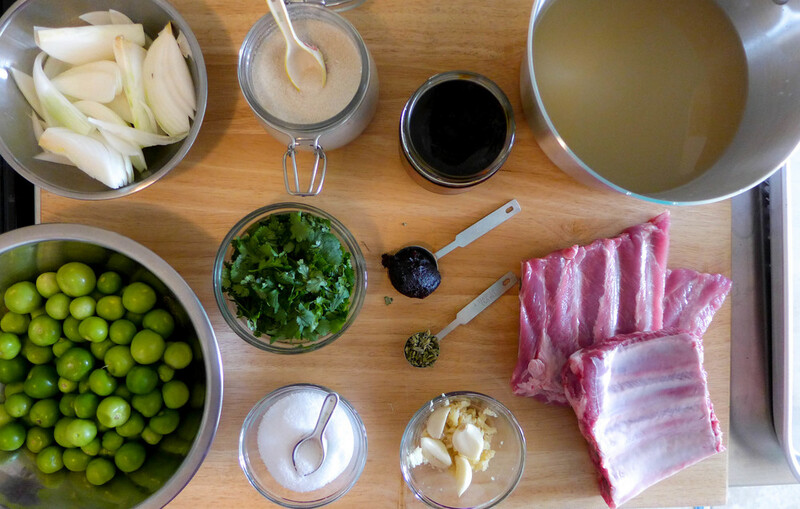 Bring pork and broth to a boil in a 6-qt. dutch oven or saucepan over medium-high heat. Cook, stirring occasionally, until all liquid evaporates, about 1 hour. Continue cooking pork, stirring often, until it begins to caramelize on the outside, about 10 minutes. Add chopped garlic, oregano, and onion. Cook, stirring, until soft and lightly browned, about 10 minutes. Add sauce, and fry, stirring constantly, until slightly reduced, about 5 minutes. Add 4 cups water, bring to a boil, and then reduce heat to medium-low; cook, stirring occasionally, until pork is tender and sauce is thickened, about 30 minutes. Season with salt and pepper. Divide pork and sauce among serving bowls and garnish with chopped Serrano chiles, avocado, red onion and lime. Serve with tortillas. Posted on February 27, 2014 by Bricia Lopez and filed under recipes and tagged Costillitas en Salsa Verde Entrees.